Book our work shop now! 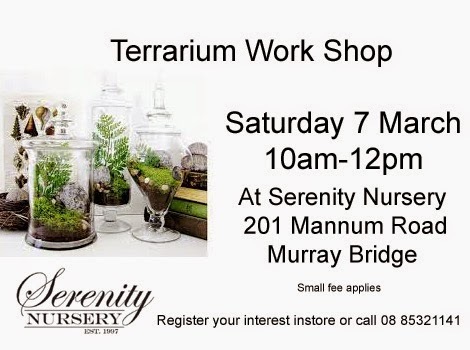 Come along and learn all about Terrariums. 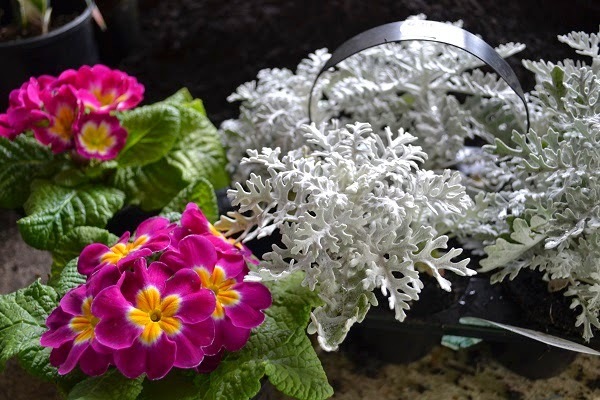 Our staff will demonstrate how to create exciting table top terrarium displays using a range of different plants. Part proceeds to BEYOND BLUE. 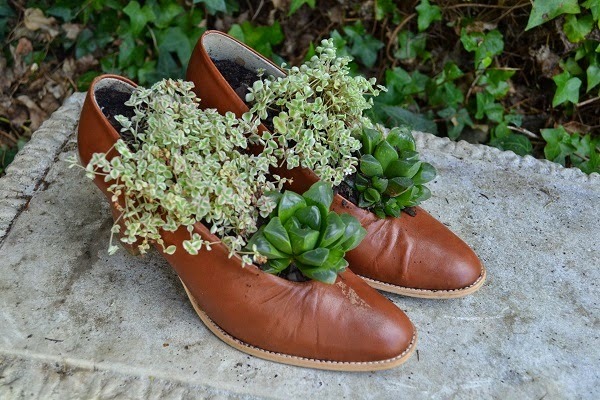 It's lovely to see what our customers do with our products. These pictures show a great country garden using our water feature as a focal point. Owner Shane plans to use a solar powered pump to create the gentle sound of running water. We must add that we love the retro bench and old wicker chairs under the veranda and what a view! 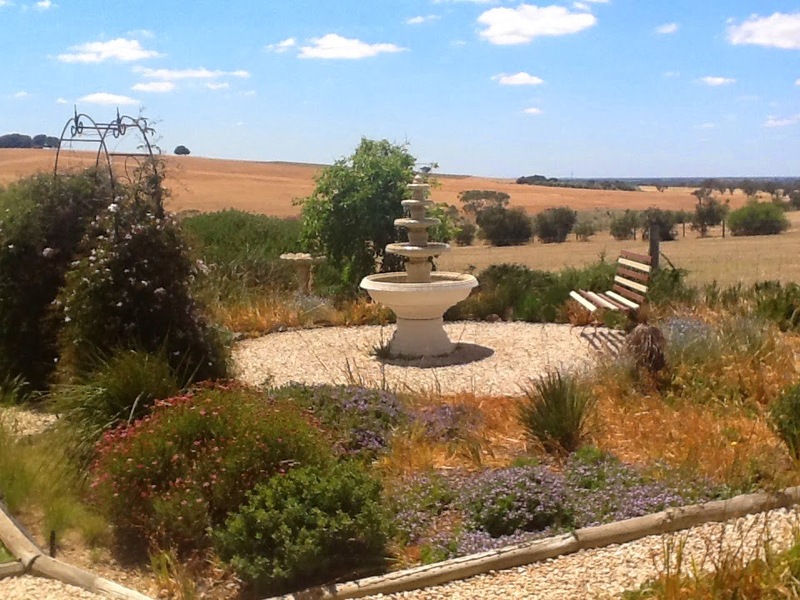 Look out for our story on how to use water in the garden in the December issue of South Australian Garden and Outdoor Living Magazine. 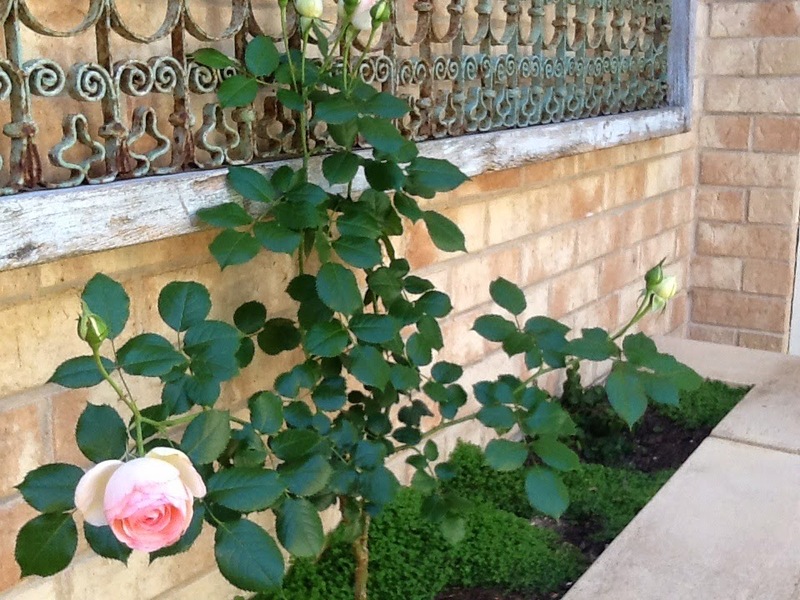 We rave about this climbing rose a lot and here it appears on the blog yet again. Pierre de Ronsard is one of the most beautiful cupped shaped roses with a mix of cream and pink petals. 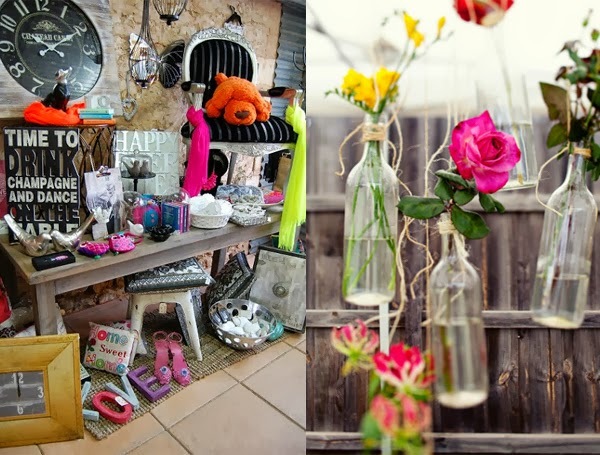 We took a sneak peak into the courtyard of stylist Monica Wills. A vintage gate panel has been re purposed into a wall art/ trellis and the climbing rose graces it perfectly. 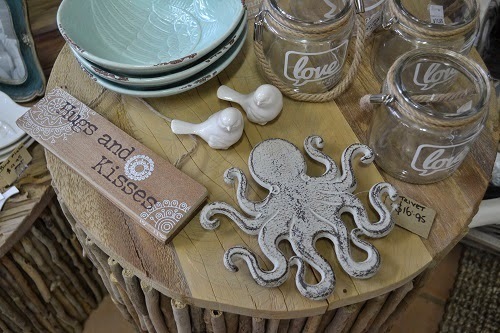 Drift wood tables and clear, white and pastel blue gift ware. Lot's of hand made shell decorations. 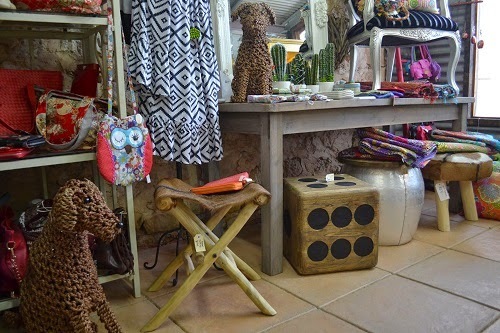 Explore the wagon shed for an affordable yet stylish gift. 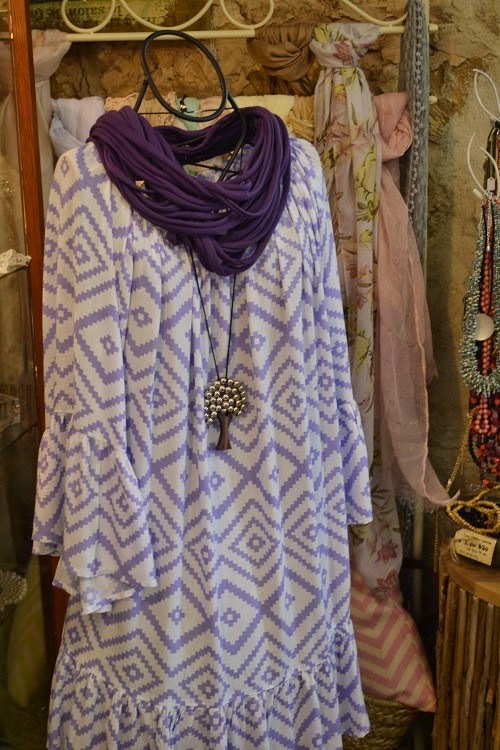 Find purple fashion, purple hand painted cow bells and mauve throw rugs at Serenity Nursery now. 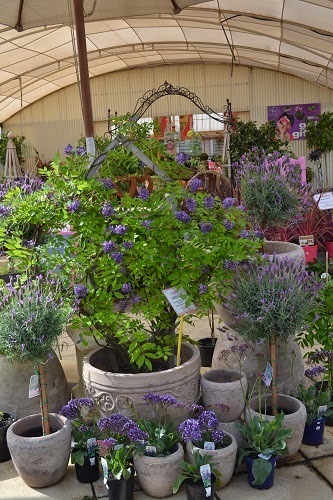 Pictured here: An espaliered Amethyst falls wisteria, standard lavender and statice all featured in our lovely café style pots. spreading bacopa and spreading calibrachoa. What's in the old wagon shed? 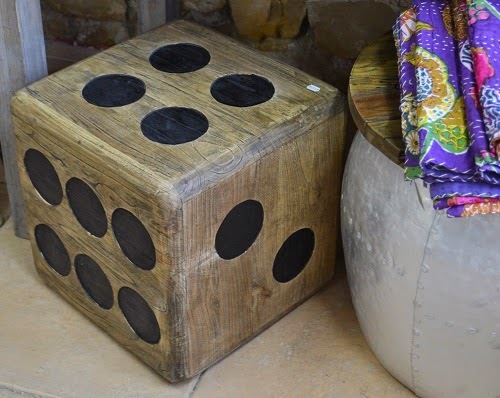 Timber dice stool/ coffee table. Aluminium and timber coffee rest and hand made throws. 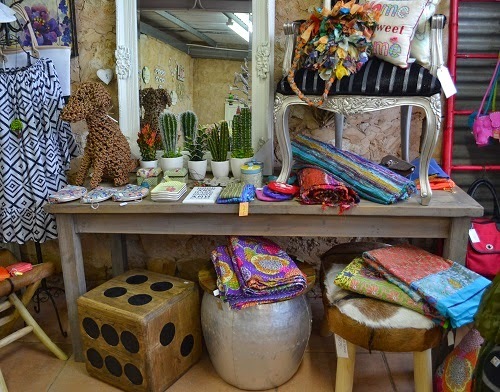 Hand made gifts, Multi coloured floor rugs and faux cacti. 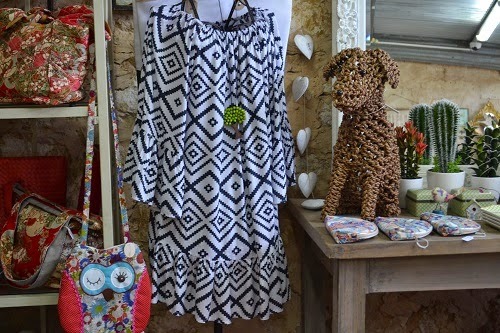 New Summer fashion and necklaces. 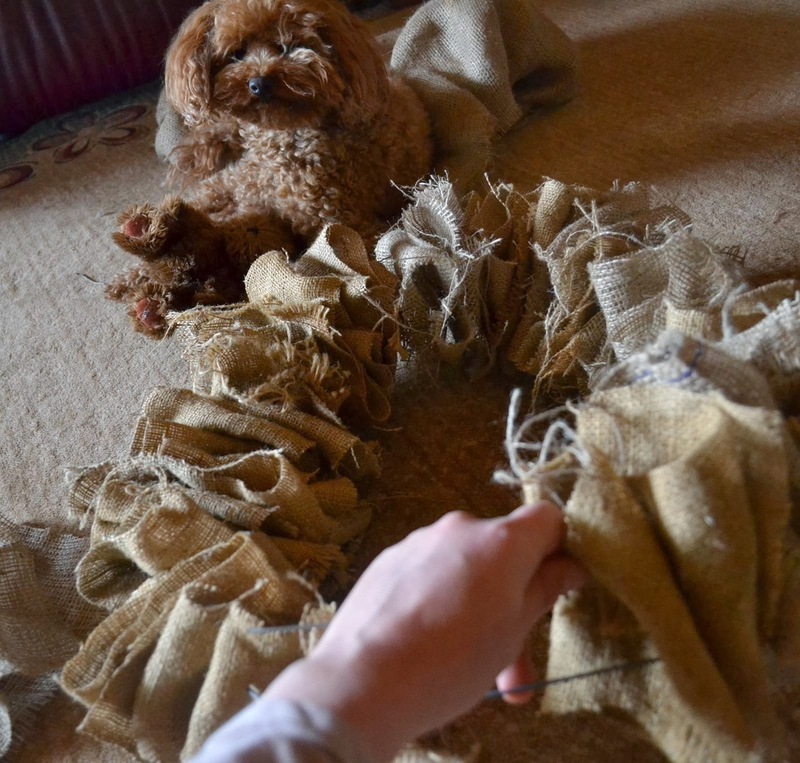 Rope dogs and crafty handbags made from fabric and leather. 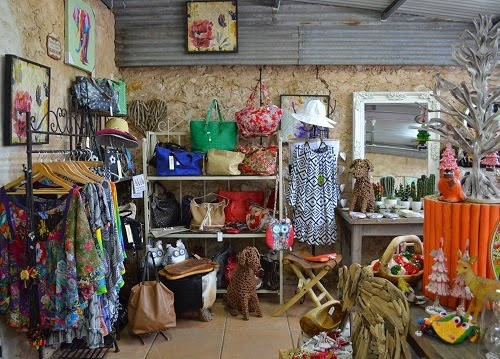 The old wagon shed full of on trend goodies. 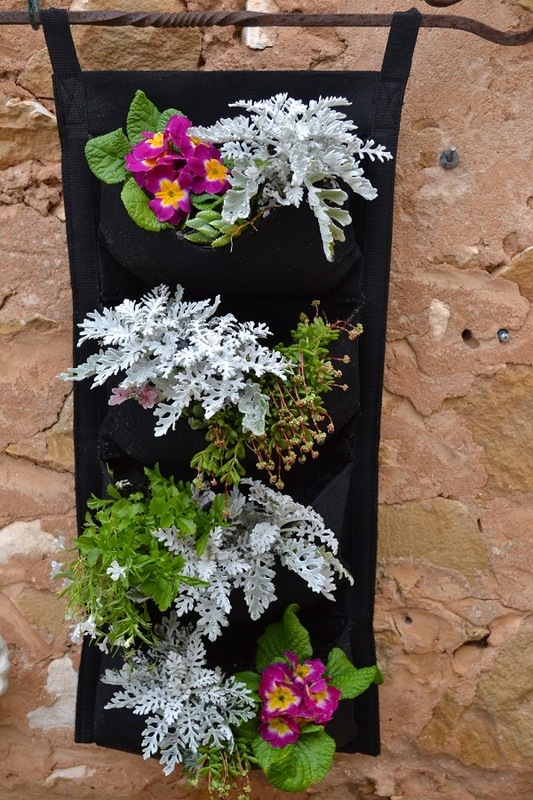 Vertical gardens are a great way to use spaces your garden that are sometime not utilised to their full potential. 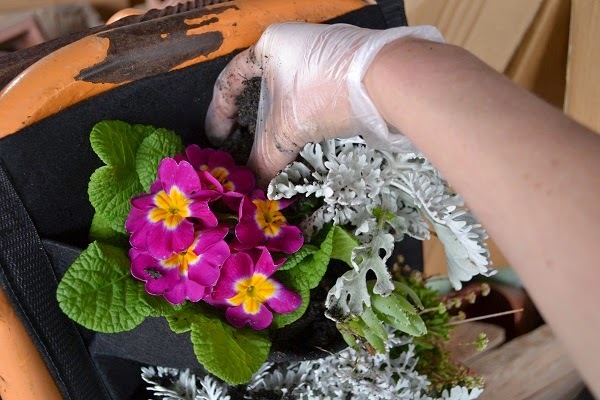 We have selected a mix of annual plants including polyanthus and silver dust but you could create an edible upright garden by choosing herbs and vegetables. Look out for tumbling tomatoes for a cascade effect. We have used breathable felt eco gardens for this project availble from Serenity Nursery. I removed the plants from their cells and teased the root ball. 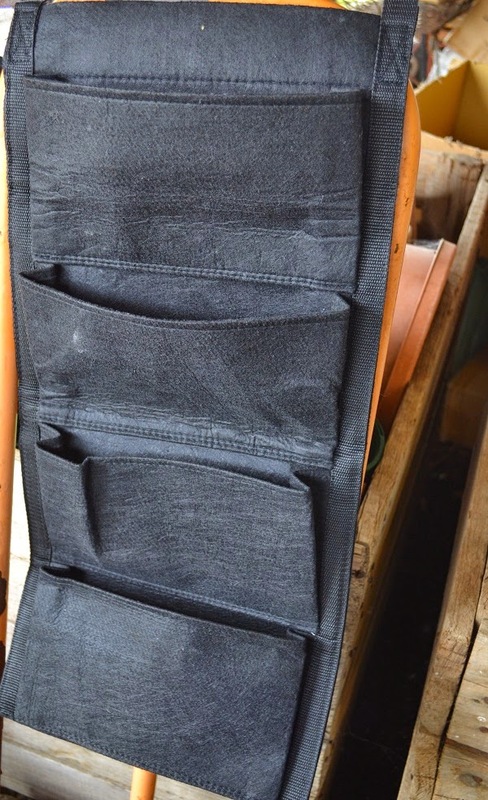 I placed them in the pockets making sure different colours and textures were alternated. I used a good premium potting mix by Plants Plus called Terracotta & Tub. This potting mix contains a slow release fertiliser and wetting agent which prevents the soil drying too quickly. I carefully pushed the soil around the plants and watered in well with a seaweed tonic. The vertical garden all planted up and displayed on the old stone feed shed in the nursery. 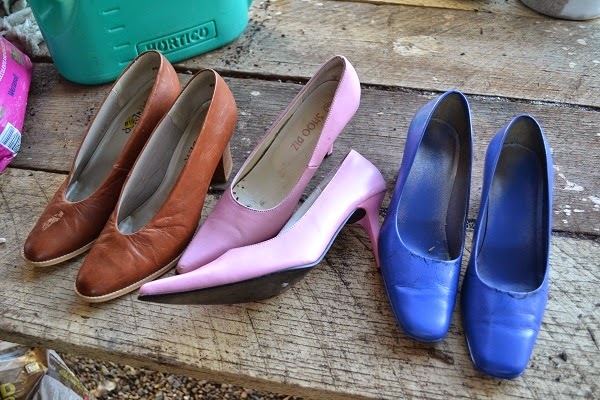 Start with a pair of high heels or stilettos. I found these ones at a local op shop. I spray painted the black pair purple. You can use any colour you fancy. 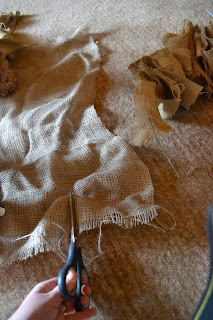 Then drill two -three holes right through the sole for drainage. I used Amgro succulent and cacti potting mix. 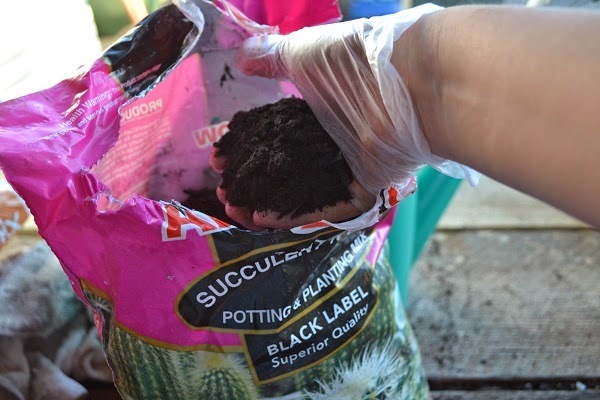 This mix is free draining and perfect for the plants chosen. I had fun choosing some succulents from the nursery. 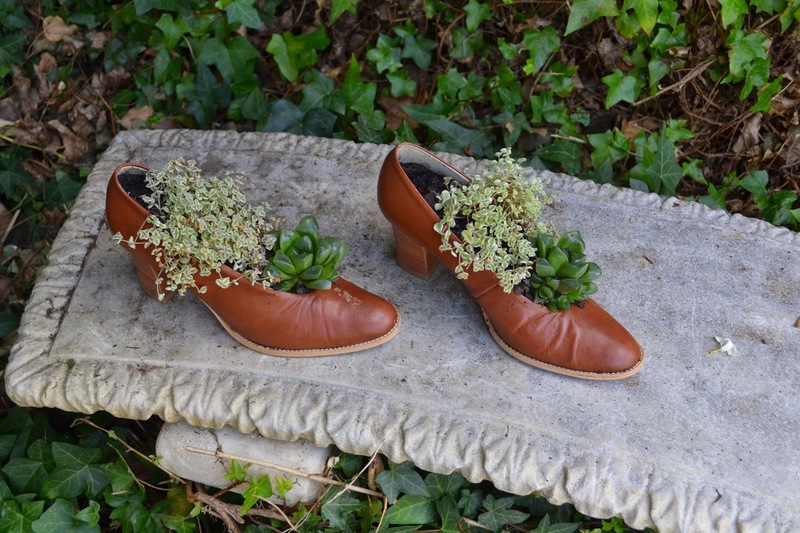 The rosette formed succulent acts as a sort of shoe embellishment and the finer variegated succulent will cascade out of the shoe. 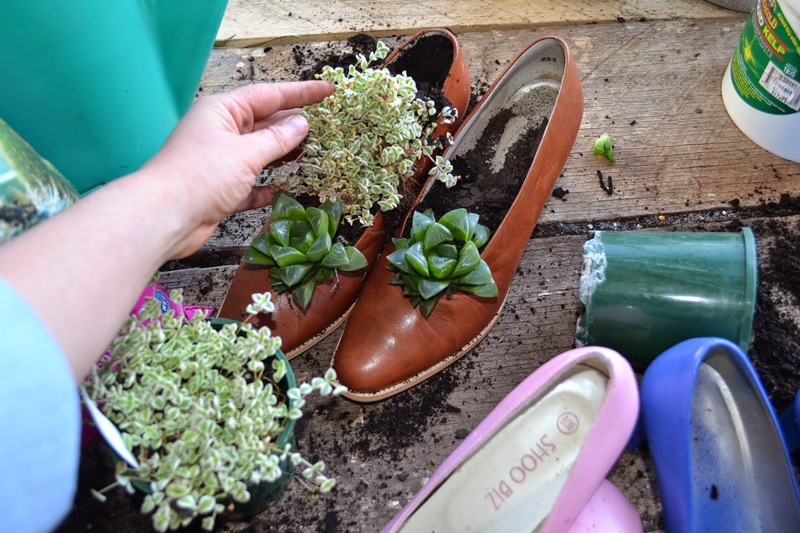 Fill the pointy toe part of the shoe with soil and then place the plants in. Back fill with soil and press firmly. 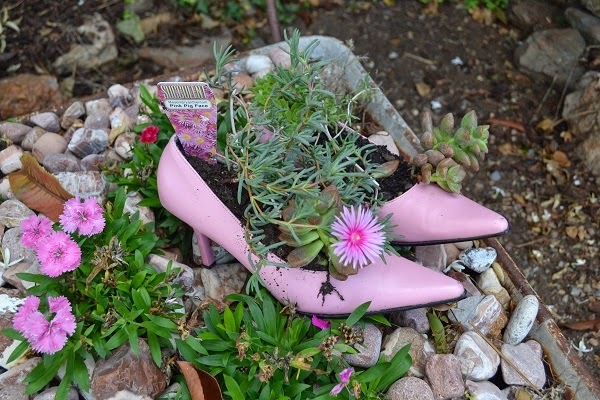 Succulent with pink tinges and pink flowers were matched with the pink stilettos. Purple spotted succulents were teamed with the purple shoes. 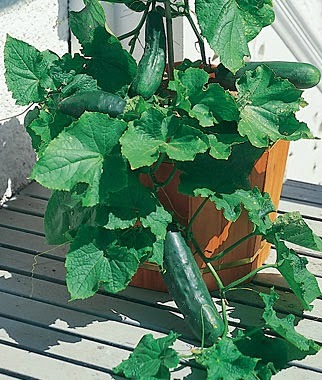 Mr & Mrs Serenity, how does your garden grow? 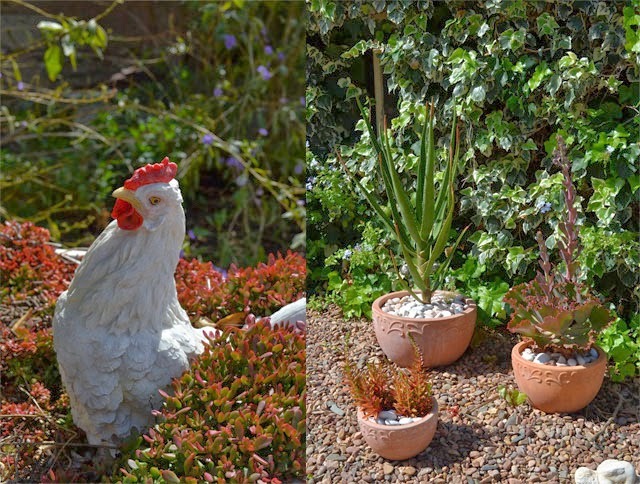 A potted display and chook ornament adorn the old cottage. 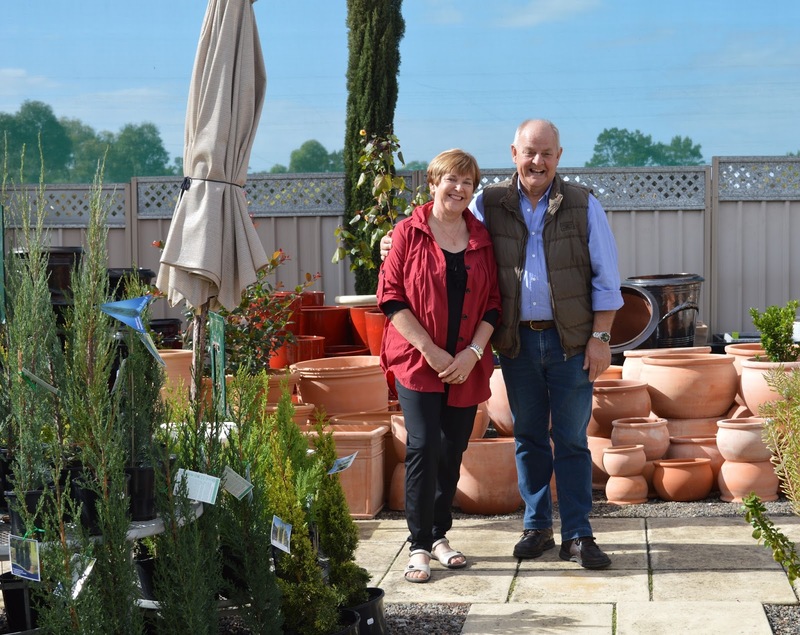 Let's take a little tour around the homestead at Serenity Nursery. Dotted with stone cottages and buildings from the yester year, it's no wonder Marian and Rod aka Mum and Dad have a flair for the nostalgic and a little bit of country whim. 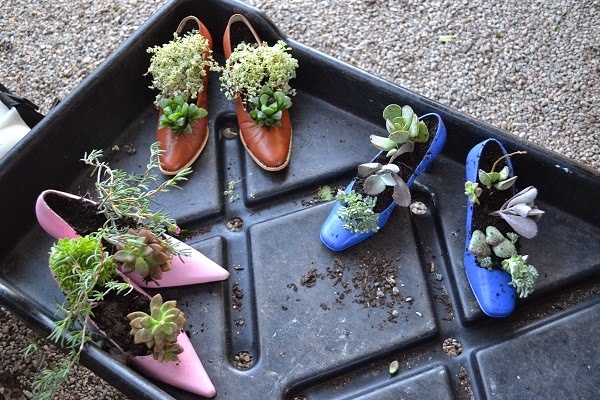 Here they have potted some kalanchoe succulents and an aloe tree into a trio of terracotta pots in their private Serenity garden. The ivy backdrop, as wild as it can grow, always looks lush. 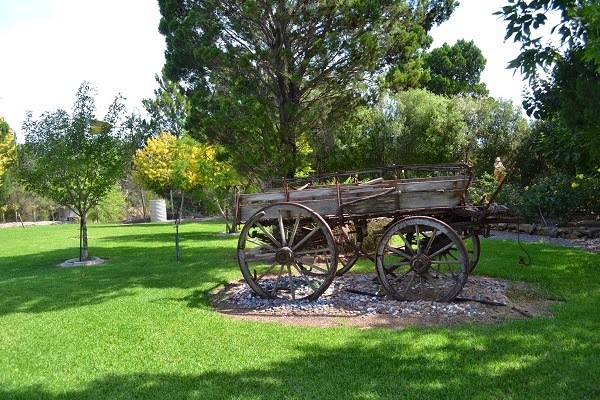 The old wagon parked next to heritage scrub. 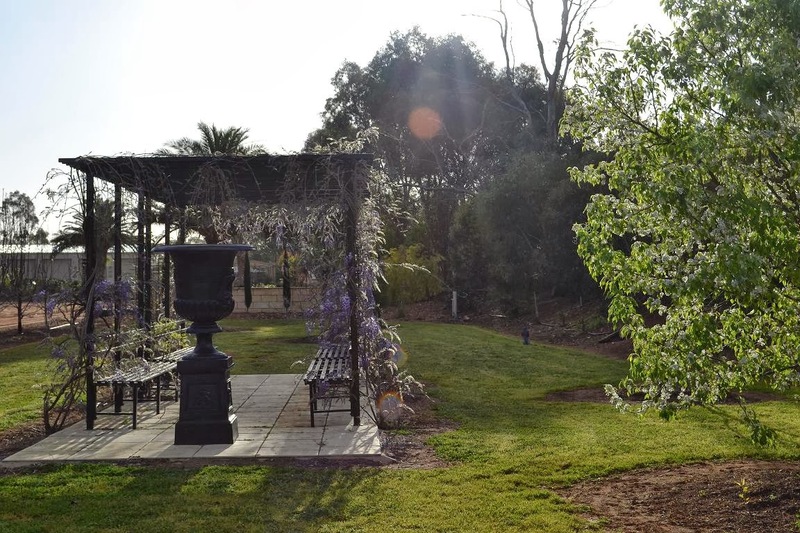 Most of the trees you will find growing at the Serenity Gardens are native to the area. In fact 5 acres of the nursery property are heritage listed scrub land. 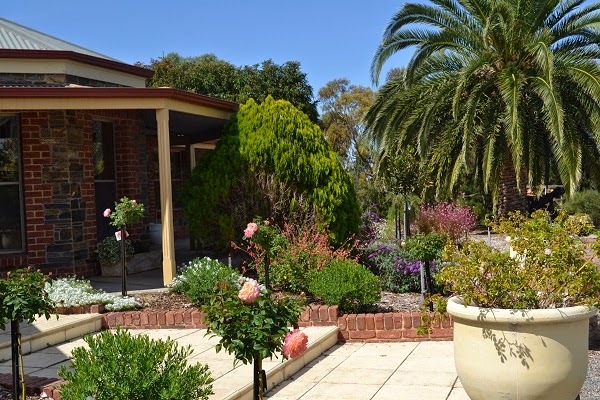 The lawn areas are dotted with some ornamental trees that Mum and Dad have planted over the years. Gleditsia 'Sun Burst', ornamental pear "Aristocrat", and ash trees are all doing well in the Murray Bridge climate. A pretty cottage garden inspired by "Monet's garden" makes for a colourful display at the front of the homestead. 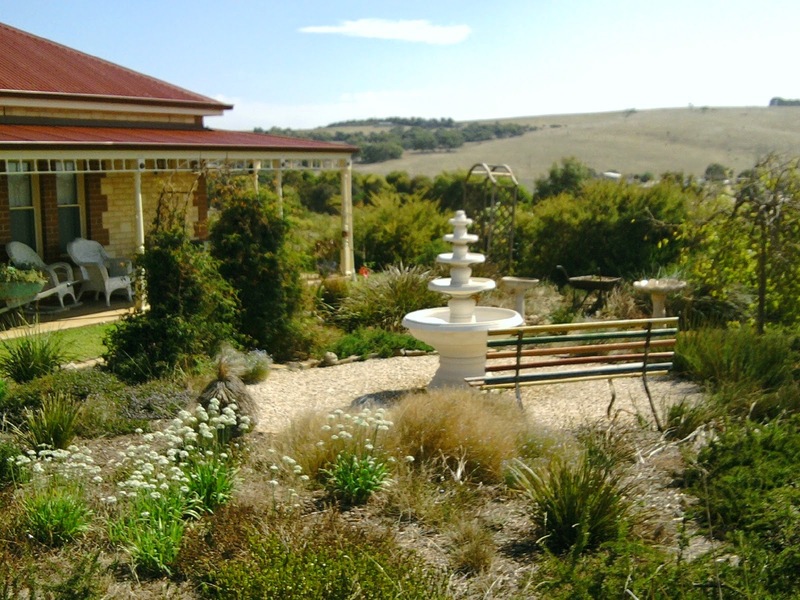 Last year Mum and Dad removed all of the plants from the front of the homestead. The garden was getting tied and needed a fresh start. 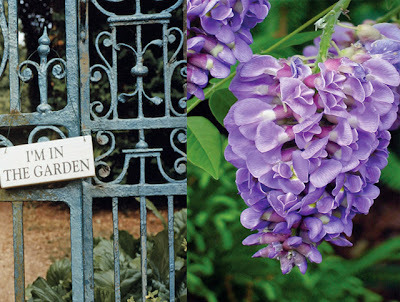 The concept for the new garden was Monet's Garden. We wanted lots of hot colours clashing together like one of Monet's Impressionist paintings. Here they have lined the steps with standard roses ( Augusta Louise and Fire & roses). Dwarf Polygalas with purple pea-like flowers are planted in between each standard rose. Salvia "Ember's Wish" and Dwarf Buddleias for intense garden colour. 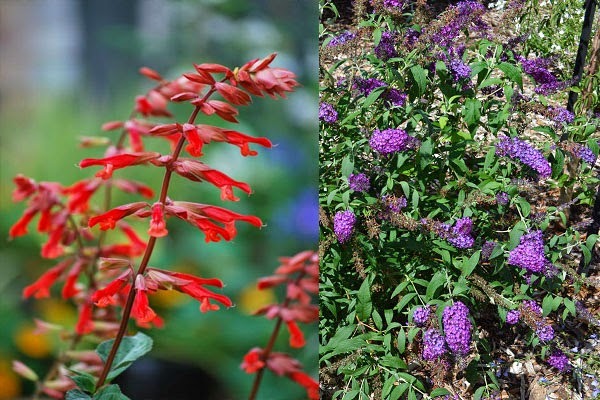 Salvia "Ember's Wish" ( pictured left) sits along side purple flowers to make it vibrate even more. Salvia " Embers Wish" grows to 80cm x 1.20cm with a mass of bright coral flowers covering the plant in the warmer months- but don't be surprised if it flowers all year round. 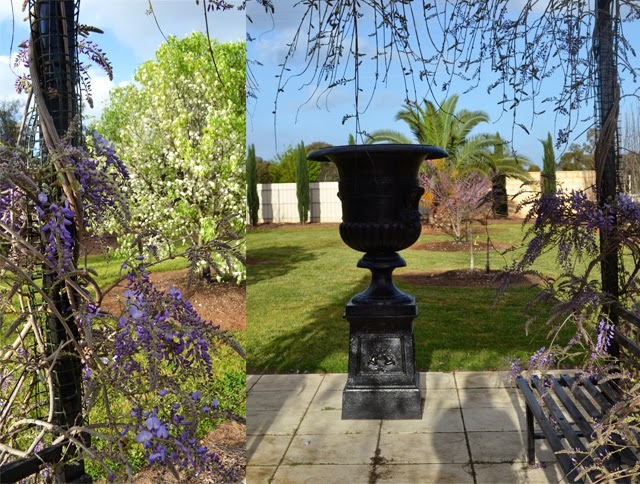 The purple flowering dwarf buddleia ( pictured on the right) only grows to one metre making it quite compact compared to the buddleias we are used to seeing that tower over two metres tall. The deep purple elongated flowers attracts butterflies. New realease Fire& Ice Rose. A close up of "Fire & Ice" Rose. 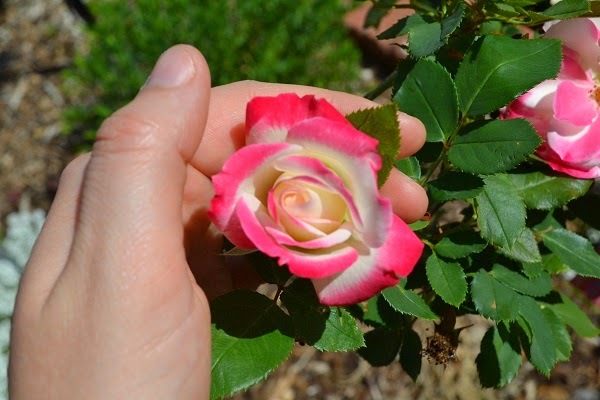 One of the prettiest two- tone roses around. 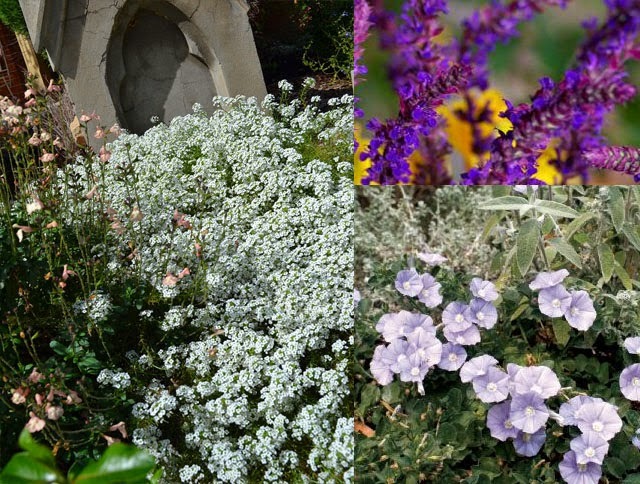 Perennial Alyssum "Snow Princess" softens the edges of the garden and looks like a sea of heavy snow. Salvia "heat wave glow" features soft peachy flowers and Salvia "Caradonna" could almost be mistaken for Italian lavender. The mauve moon flowers of convolvulus trail over the moss rocks, closing their blooms at night and reopening for a fresh day. 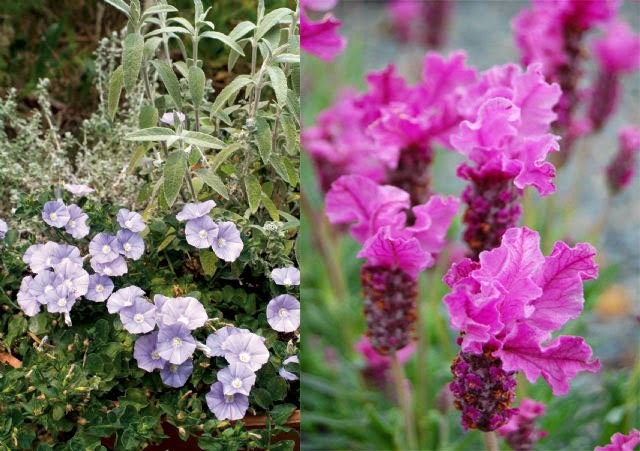 Moon flowers teamed with deep pink ruffle flowers of "The Princess Lavender"
The Princess Lavender ( pictured Right) is an easy to grow lavender with deep pink large flowers and fragrant foliage. The flowers will last well when picked for indoor display. 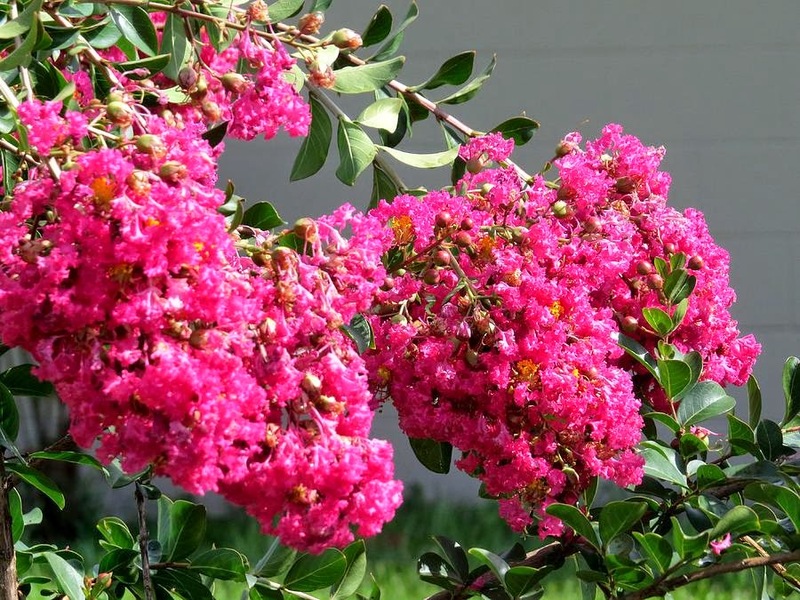 And finally we couldn't plant "Monet's garden without growing one of the best flowering trees around, Crepe Myrtle "Tuscarora". The large flowers actually resemble crepe paper and are available in white, mauve and pink tones. Hope you enjoyed our little tour. 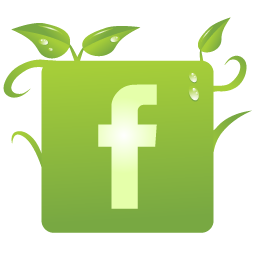 Sign up for the blog so you don't miss a post. 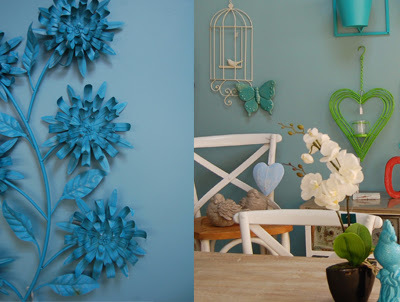 Serenity Nursery new "blue room"- No more red walls!!! One thing we try to always do is surprise and delight our customers. We had a purple and grey painted room which was painted red about three years ago. Everyone loved "the red room" and we mostly decorated it with Asian style pieces. Well this week we thought out with the old and in with the new. 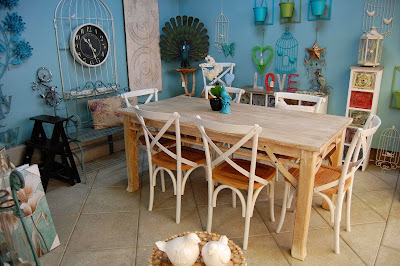 We pained the walls of the red room a pretty pale blue and we love it. It's fresh, summery and bright. Pop in and have a look how we decorated it...our theme was "no theme" and we have mixed french style chairs with modern metal home wares and our very popular multicoloured side board tables. 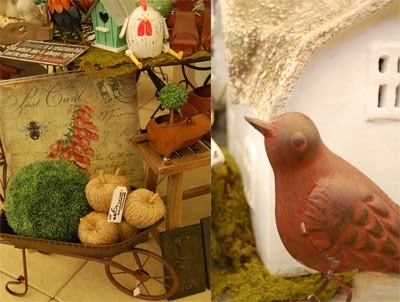 A gift for a gardener..
Find adorable gifts at Serenity Nursery. 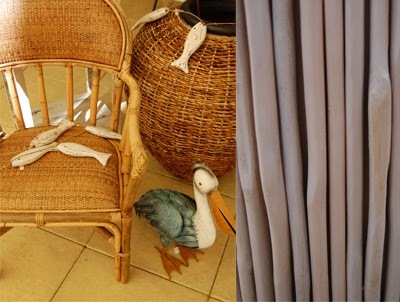 Serenity's woven chairs and urns will add warm to your home or garden. 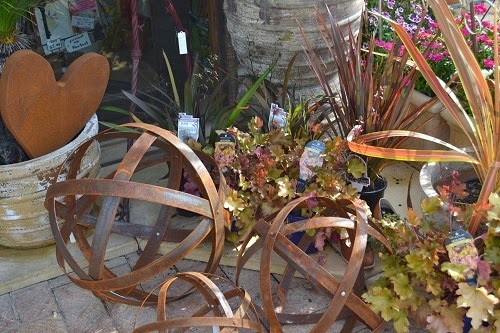 Come and fossic through our lovely garden gift displays. 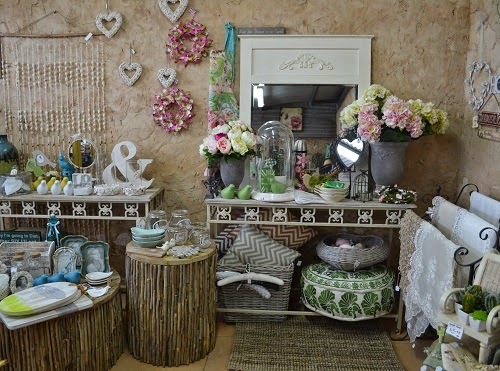 You will be sure to find a gift for someone who loves to decorate their home or garden. This Christmas wreath is so easy to make at home with material from around the house. 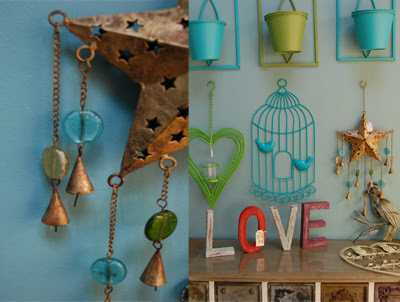 Start with two wire coat hangers and cut off the hook part on both of them using wire cutters. 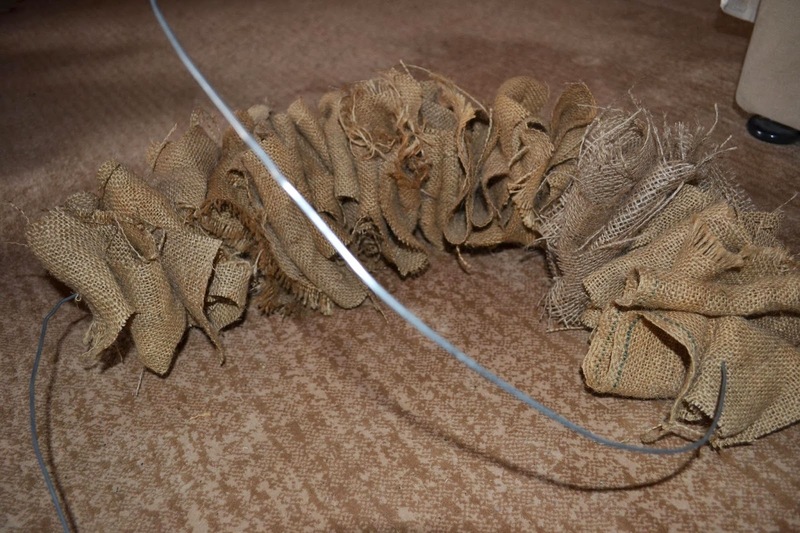 Twist two of the ends together and bend the Wire into a circle. 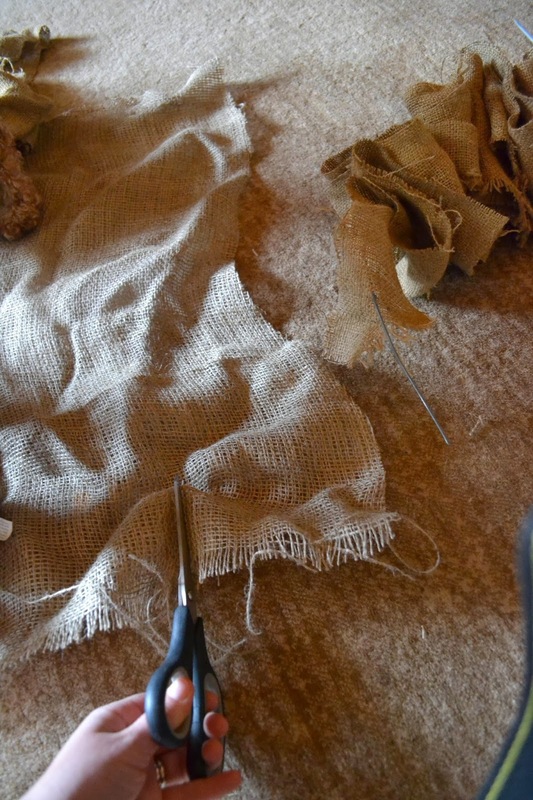 Cut hessian strips about 4cm x 30cm. Thread the wire through the hessian folding the hessian back and forth as you go. 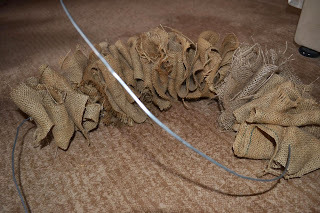 Keep threading until all the wire is covered. 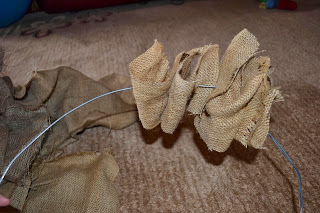 Once all hessian is threaded on twist the remaining ends of wire together. 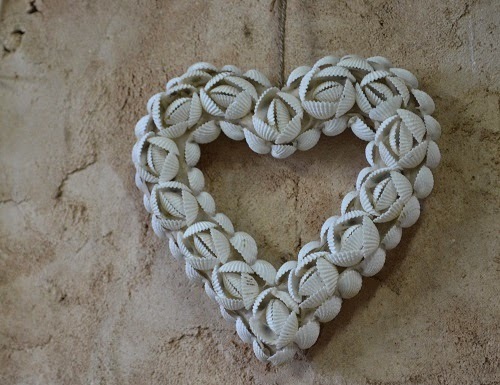 I finished my wreath off with a wooden heart from Serenity Nursery. 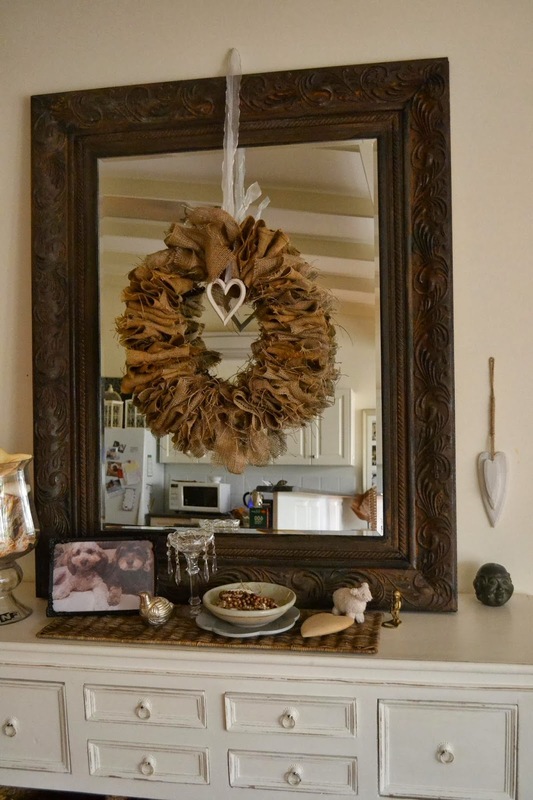 I used organza ribbon to hang the wreath from my mirror. There are lots of beautiful Christmas decorations to choose from at Serenity Nursery. Use them in Christmas craft or to decorate your Christmas tree. Pretty pastels are another theme we have chosen and our powder pink, blue and white hanging hearts and garlands are a gorgeous decorative touch for the home...Mum found them on an overseas buying trip so they are truly unique to us...Enjoy. PS. 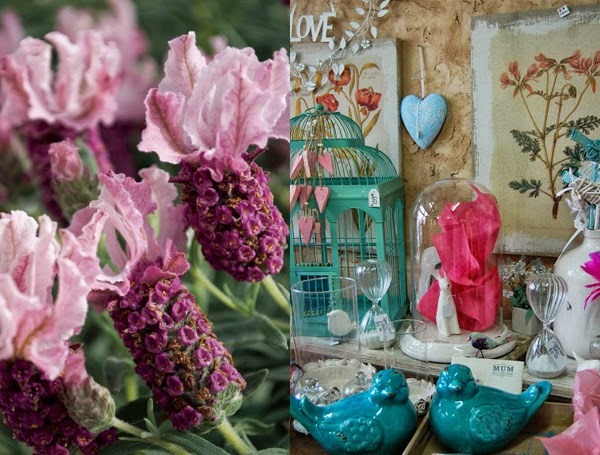 Love lavenders? pop in now for a huge offering, including the one pictured here!